A Look at The Walking Dead- Season 6, Episode 9: “No Way Out” | What Else is on Now? “No Way Out” comes to life as one of, if not the largest herd of walkers the group has ever faced roams the streets of the Alexandria Safe Zone. 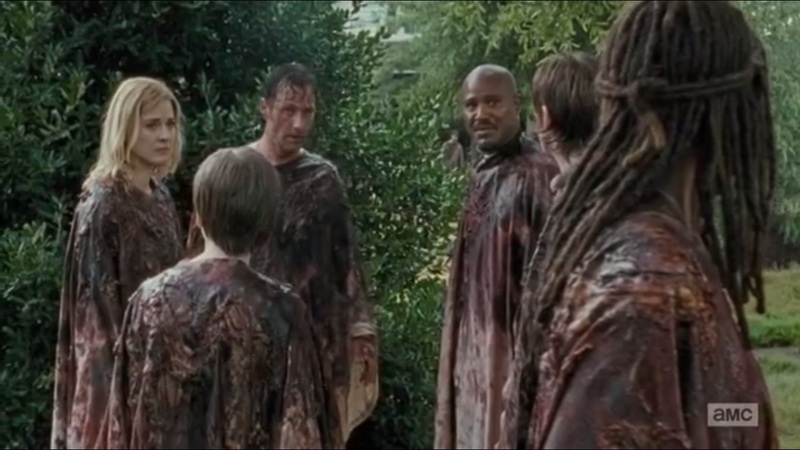 We pick up with Rick’s plan to make a path through the walker horde, but things go south fast. Let’s pick up with the second half of Season Six of The Walking Dead. 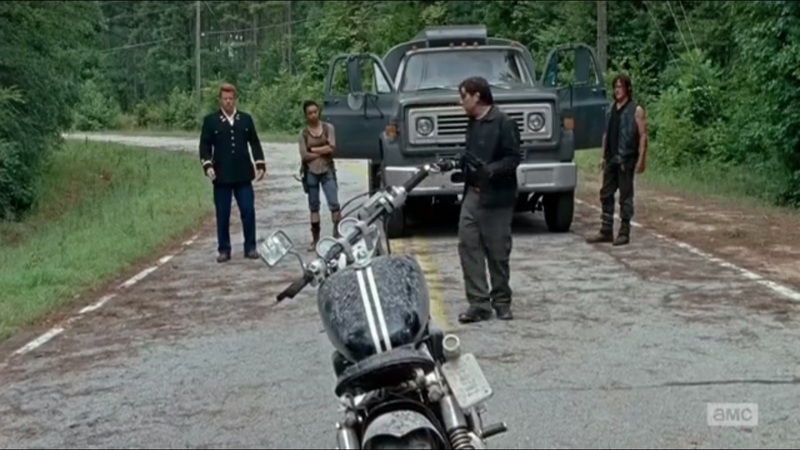 The episode begins with Daryl, Abraham, and Sasha on the road. They run into a group of men that order them out and demand they hand over their weapons and all of their supplies. Why? Because their property now belongs to Negan. The leader of the group takes their weapons, though Abraham is more resistant. He eventually concedes and also hands over his sidearm. Sasha asks who the men are, but they have questions themselves and they’ll be the ones asking while they drive the three back to wherever home is to them. First, they want more than the weapons. Daryl says they already took it, but the man maintains that there’s always more. When the three don’t make a move, one member of the group starts working his way along the tanker. Abraham asks who this Negan fellow is. The man says that the group introduces themselves by killing someone. Once again, they’re told not to ask questions. Before he can fire, Sasha tells the man to wait, telling him that he doesn’t have to do this. This prompts him to pull out another gun. But he doesn’t fire. He was never gonna kill anyone. Or…yes he is. 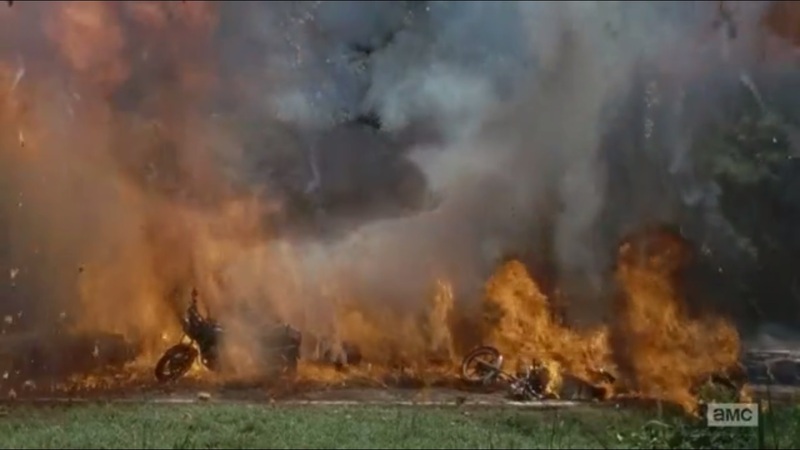 Then the goddamn motorcycles explode in a glorious fire. Good thing Daryl had that launcher handy. 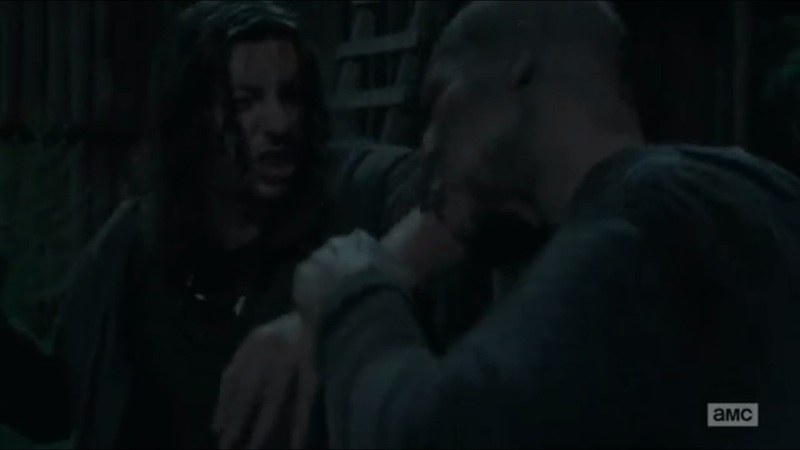 Daryl managed to get the better of the one gang member. I guess that was a quiet fight. Well, looks like our heroes are in a good place right now. Back in Alexandria, the walkers continue to roam the streets. After all, the community is open. Rick and the group continue to make their way through the pack, keeping quiet to avoid raising suspicion. One false move could ruin this, and the herd looks endless. Rick whispers that there’s a new plan. With too many walkers spread out, they need the vehicles back at the quarry. They’ll round up everyone and leave the community until it’s safe to return. Jessie suggests taking Judith to the medical bay, but Gabriel offers to take her instead, as he’s supposed to and will. Jessie tells him to take Sam, but he insists that he can keep going. Rick thanks Gabriel for promising to keep Judith safe. As he leaves, the others continue their way through the herd. 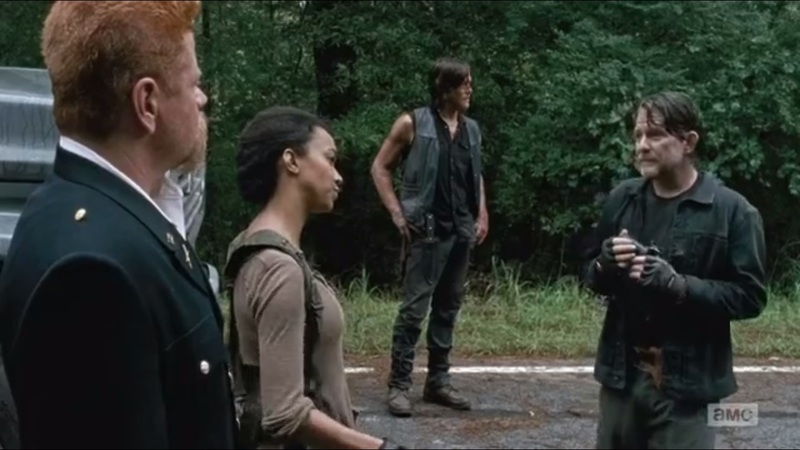 Rosita, Tara, and Eugene argue on how, if at all, they can save Denise. Rosita wants to make sure that Carol and Morgan are okay, and then they can make a plan. Carol, despite being body slammed, is up first. Morgan wakes up soon after and realizes that the Wolf and Denise are gone. 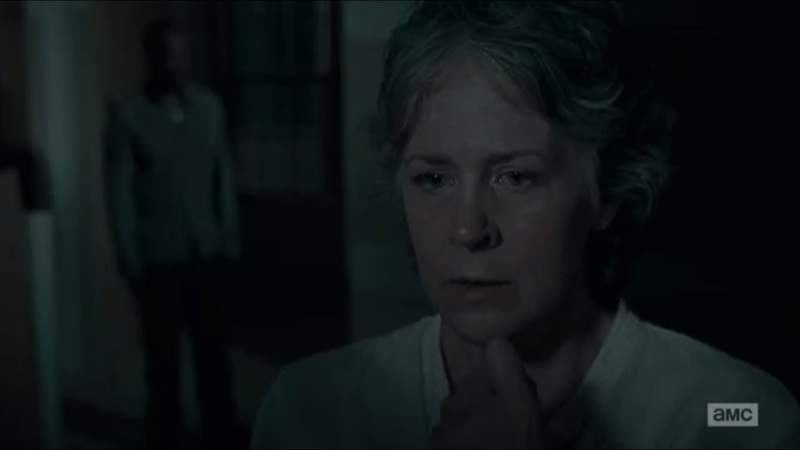 Carol realizes that the Wolf took her. She takes Rosita’s gun and goes around to sweep the place for any other surprises. Outside the walls, Glenn and Enid arrive in the church and search for weapons or anything they can use to climb to the other side or at least start a fire. Churches typically tend to have things like that. 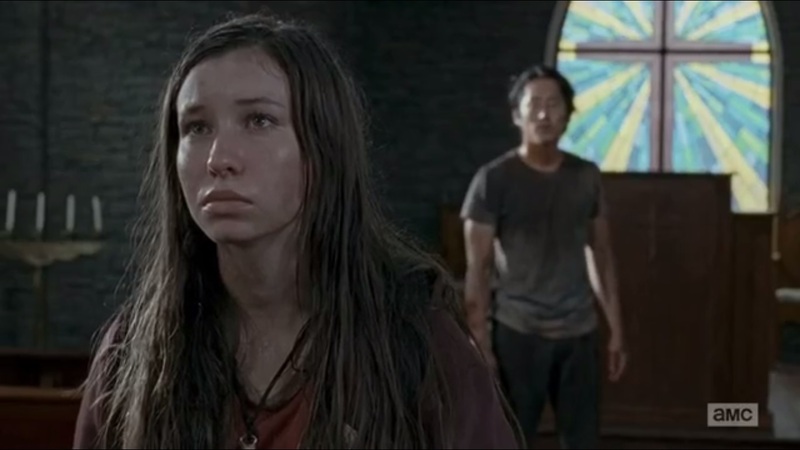 Enid says that when she wanted to run, Glenn said that’s how you lose people. Even after they’re gone. What the hell does that mean? Glenn says that people you love make you who you are. They’re still a part of you. If you stop being you, that last bit of them inside of you is gone. To Glenn, those people are his parents, Maggie’s father, a woman named Andrea, Tyreese, a man named Dale…but who are they to Enid? Her parents. And they’re still here, Glenn says. 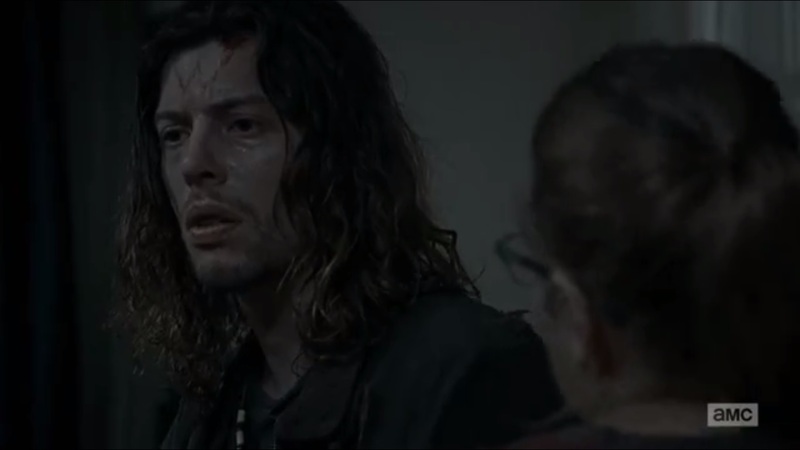 He tells Enid to stay put, but she’s here now and will still help him save Maggie. She says she can climb up the gate while he distracts the walkers. After all, she’ll just follow him anyway. Enid plans to make something Maggie can use to climb down. 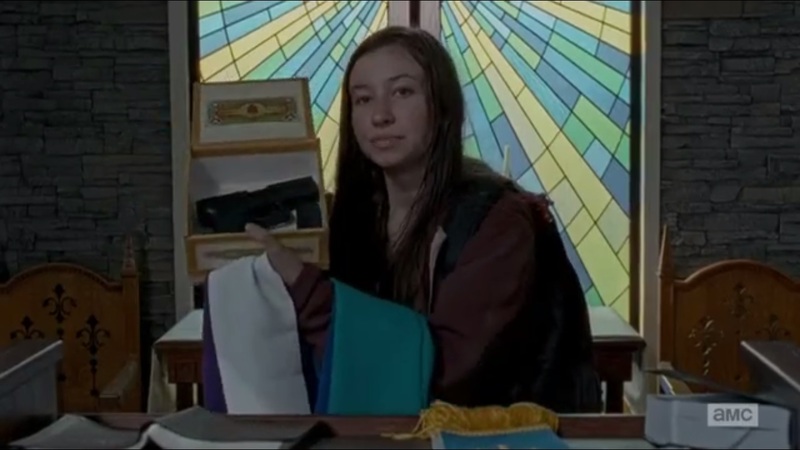 After some searching, Enid finds a gun in a box and tells Glenn that she’s still going to help. I sort of wish that the Zelda ‘Got Item’ music played when Enid found that gun, but you can’t have everything. Outside, Denise and the Wolf continue along the gates. He insists that he needs her help. He says that she was right about who he was before- he’s changed and how she’ll help him change because of her gift. She’ll realize it one day. Night falls as Rick and the others continue making their way through the herd. Sam picks the wrong moment to remember Carol’s chilling words to him as he breaks the chain. Denise and Ron try to encourage him to be strong and that’s when the walkers take him. However, he’s still holding tight to Jessie’s hands as she also screams out in horror. 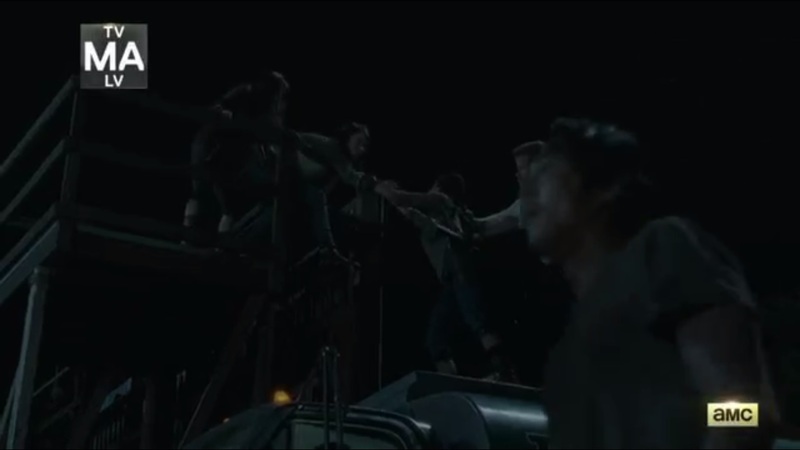 The walkers then claim her as well, but she’s still holding Carl’s hands. 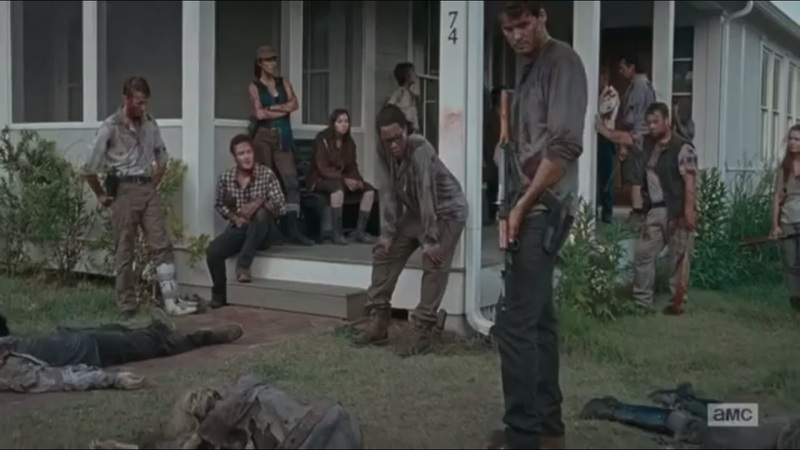 Rick pulls out his machete and severs Jessie’s hands from Carl’s- a gun drops in the process. And Ron picks up the gun and points it at Rick. Michonne puts her sword through him, but he’ s still able to fire off one shot. 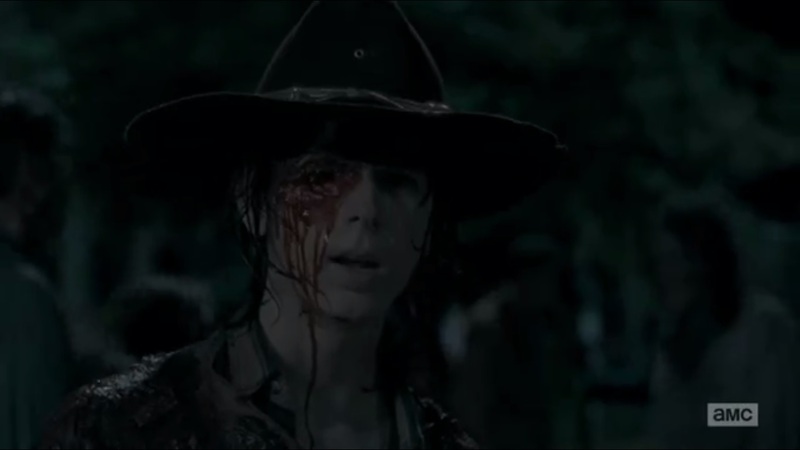 But then we see where Ron’s bullet went: right through one of Carl’s eyes. Rick picks up his injured son as he and Michonne start rushing through the herd, Michonne cutting down any walkers in her way. Back indoors, Rosita, Eugene, and Tara continue to wait. 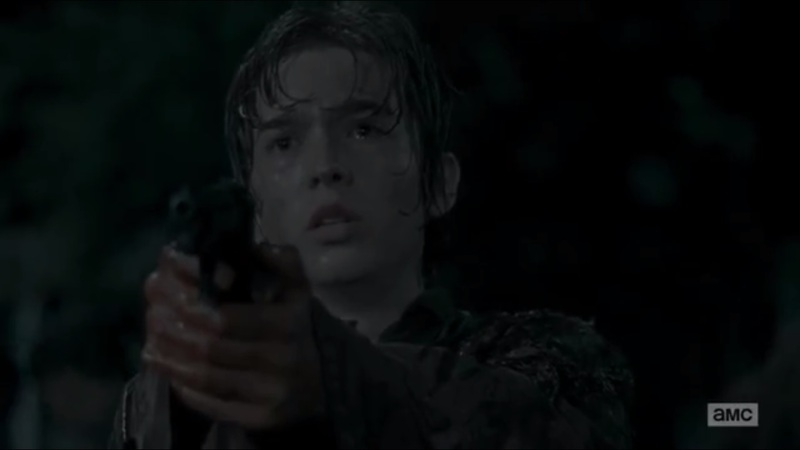 Sooner or later, Eugene says that they’ll fight their way out and he knows Rosita wants to do just that. But she knows that he won’t. The Wolf and Denise also wait. He says that his group should have waited, but they were selfish. But then, if the Wolf wasn’t selfish, he wouldn’t have gotten an IV. His plan is to get a gun and head for the wall. The two rush for the wall. The Wolf takes out some walkers attacking Denise, but he gets bitten in the process. Denise urges him to follow her to the infirmary so she can save his life. Carol continues her search and eventually sees the rush of roamers outside. Taking a seat, she composes herself when she hears a noise. It just happens to be Morgan. 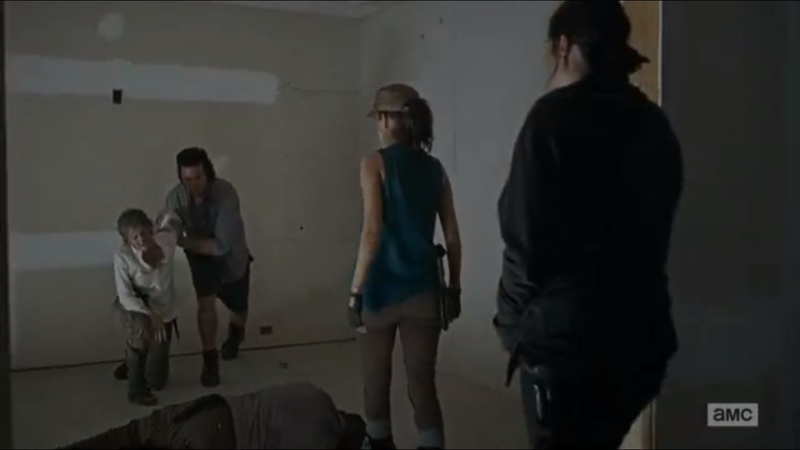 Carol, for whatever reason, lowers her gun. Guess she’s over that body slam. Morgan brings up that Carol once had a child and husband. He says that he didn’t want to hurt her, but he did have to stop her. 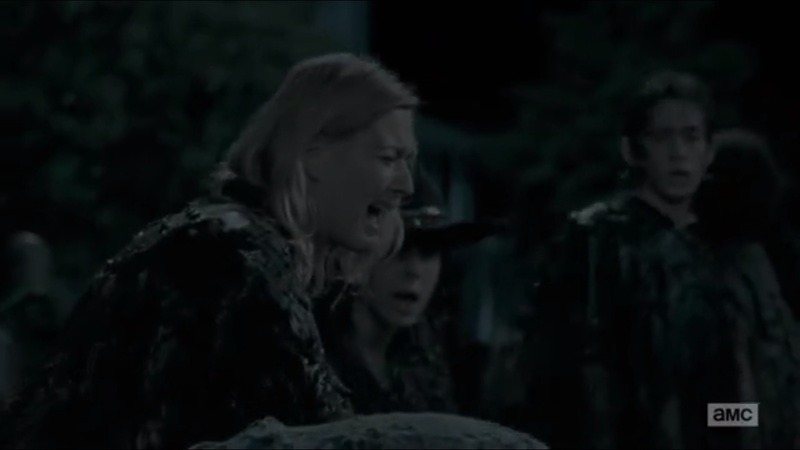 Carol counters that he still saved the Wolf for himself and that she should have killed Morgan. In response, Morgan tells Carol that she can’t. Denise and the Wolf arrive in a building. The Wolf is in a daze, but Denise is grateful for him turning back to save her. They open the garage door and speed walk their way through the crowd, but Carol, from above, shoots and kills the Wolf. Denise finally arrives at the infirmary just as Aaron looks outside and spots Rick and Michonne rushing through the crowd. They hurry inside and Rick pleads for Denise to save his son’s life. Denise and the others get to work. 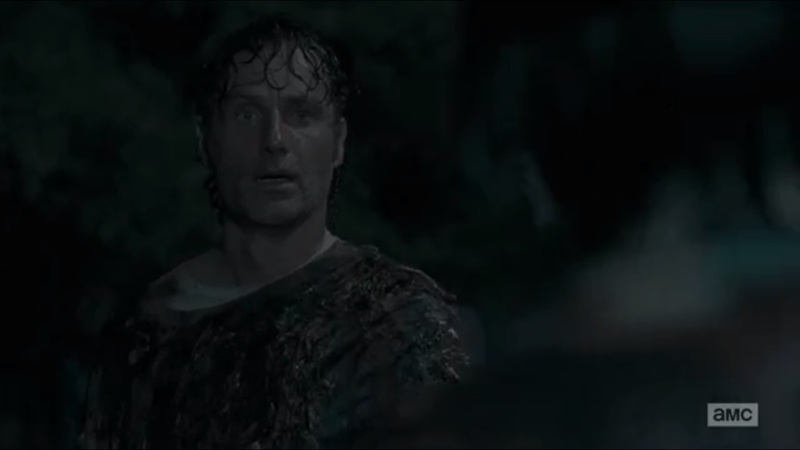 As the operation commences, Rick looks outside at the herd and takes out his axe. In a moment I can’t help but love, Rick opens the door and calmly walks outside. 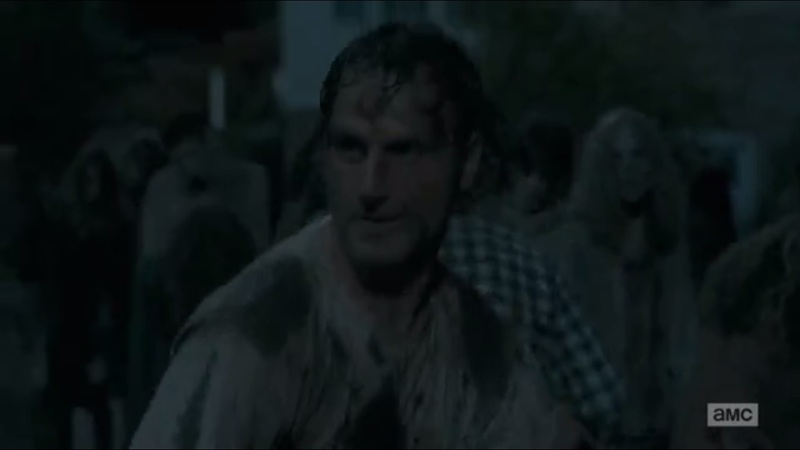 With no tarp covering him, no protection, and no backup, Rick goes out as a one man army and hacks down any and every single walker that he can see. 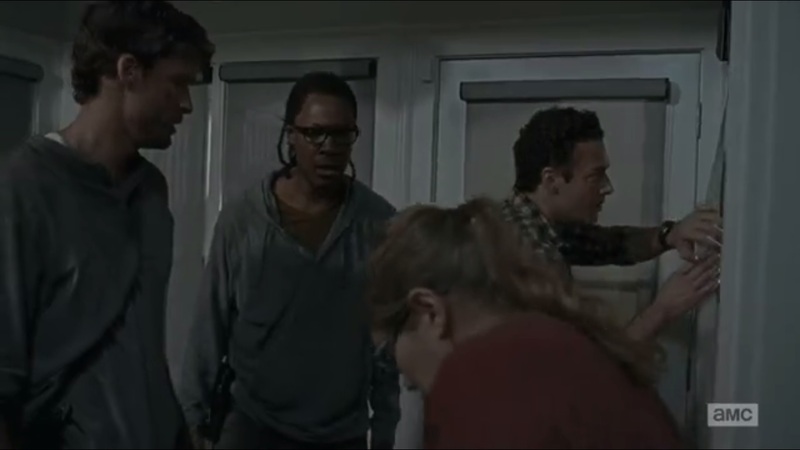 Michonne, Heath, Spencer, and Aaron soon help him while Denise continues working on Carl. As they five go hard to work and pick off as many walkers as possible, they’re joined by Olivia and Eric. In the church, Gabriel hands the baby over to one of the community members and grabs a machete. When Tobin asks what he’s doing, Gabriel says that they’ve been praying that God save their town. Now their prayers have been answered: God will save it because He has given them the courage to save it themselves. The battle rages on as Carol, Rosita, Tara, Morgan, and even Eugene soon head out to help. No one gets to clock out today. And wouldn’t you know it? The first walker Morgan encounters is that of the Wolf. Enid and Glenn- remember them?- find Maggie still atop the watchtower that’s on the verge of collapsing. 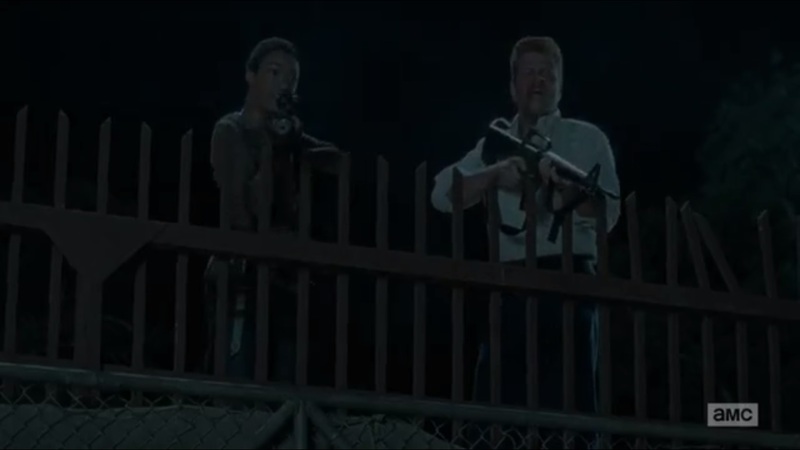 Glenn begins to draw walkers away while Enid scales the tower to help Maggie, who is surprised to see Glenn alive. Glenn insists that Maggie escape, and not like Maggie can help- she’s out of bullets. He once again finds himself surrounded by walkers, and while he’s survived worse, he receives some help from the cavalry. With machine guns toting, Sasha, Daryl, and Abraham have arrived. They help Maggie while Glenn goes over a plan. He wants to draw the walkers away, but Daryl insists that they can taken out all at once. He backs up the tanker and lets gasoline spill into the lake, while back inside, the group continues leading the herd to the wall. Daryl stands atop the van and fires a rocket. The missile hits the gasoline and a brilliant fire spreads, attracting the attention of every walker. Even still, Rick and his team battle on against the herd. As the walkers walk to a fiery death, our heroes battle on and on, cutting down every single walker that comes their way. Day breaks. Smoke is still coming from the lake as walkers litter the street like ballerina patterns. The community stands, exhausted and triumphant, but alive. Rick, meanwhile, speaks to a sleeping Carl about the others and he was wrong: these people can learn to survive if they work together. He plans to rebuild and expand the walls. Everything Deanna spoke about is possible, he believes. When Rick was out there, when it was over and he knew that they had this place again, he explains that he had a feeling that took him awhile to remember what it was because he hadn’t felt it before he first woke up. 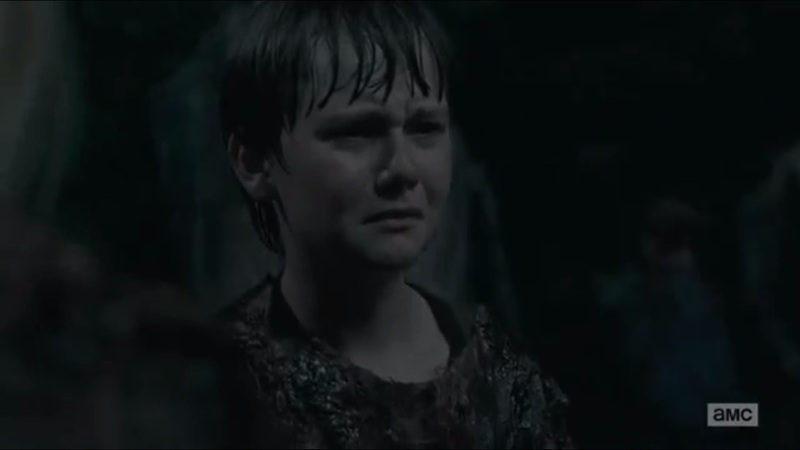 He wants to show Carl the new world and make it a reality for him. He begs his son to wake up so he can show him. Then Rick feels Carl’s fingers grasp around his as the episode comes to a close. Damn. Just…damn. This was pretty good. Great, even, with a few quibbles, but “No Way Out” was a pretty strong continuation of the season. Writing-wise, there are a few conveniences here and there. My issues aren’t enough to dilute my enjoyment of this episode. 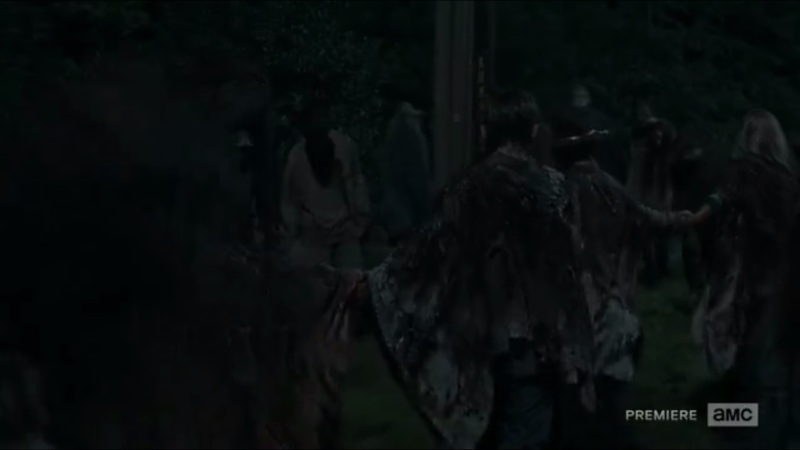 While The Walking Dead isn’t always consistent with its tone or pacing, I think the tension in this episode was well-executed with Rick’s group making its way through the walkers. It speaks volumes going back as far as the show’s second episode that Glenn’s idea to cover up in walker guts, while sounding ludicrous, still proves effective to this day. It makes you wonder why more people don’t pick up on this, as it’s a good way to move around undetected in a sea of roamers. Now, I’ll talk about the Andersons now since I don’t have a proper way to transition onto them. It’s unfortunate that Rick lost the connection he had to Jessie and that Sam ended up succumbing to his fears with Carol’s words still in his mind. And it’s worse because Jessie had proven that she had what it took to survive. It was a bit easy for them to all go down at once when this show has proven that waiting around for a liability can prove costly. Yes, that’s Jessie’s son, but when you’re in between as many walkers as they were, waiting around for him to calm down won’t end with pretty results. We don’t get much time to deal with their deaths, but this episode didn’t have time for that. Understandable. The Andersons were just three more casualties and we at least got the brief flashes in Rick’s mind to see what he was experiencing as walkers devoured Jessie. But Rick had a more pressing urgency in tending to Carl. First off, kudos to the show for actually doing this. Not that I expected the show to skip out on moments like this, given how Rick still has both of his hands, but the show managed to have Carl shot in the face, as was the case in the comics. It was a grim sight, but for Rick, this injury alone forced him to stay and care for his son. 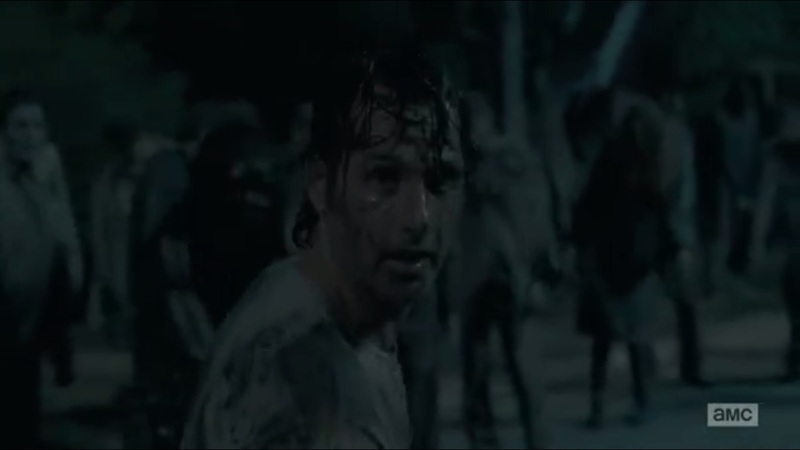 I’ll get to Rick’s monologue to Carl towards the end later, but for now, I want to talk about what may be one of my favorite Rick moments yet: his decision to go out into the herd, alone, and cut through as many walkers as he could. I’ll admit, it is plot convenience that he wasn’t overrun or because Rick Grimes is an unstoppable force who needed to vent. That said, I loved that moment where, after looking out the window and giving it some thought, he simply takes out his axe without a word and leaves the infirmary. This is one of the reasons why Rick being so headstrong makes him a good leader. 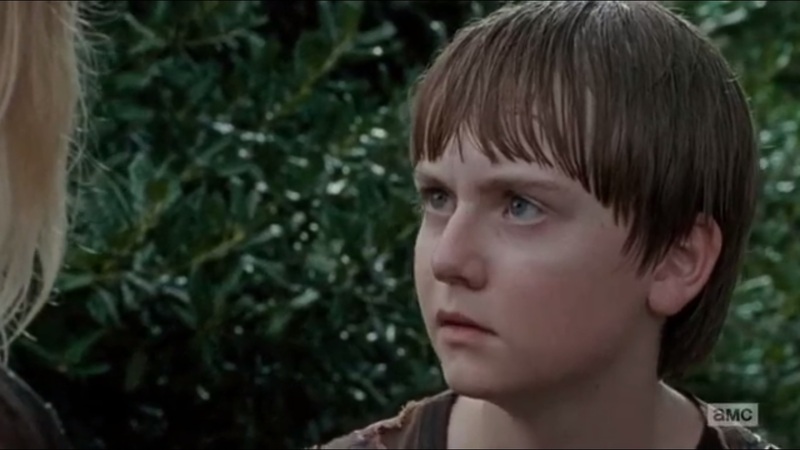 He knows that he doesn’t have a solid plan, he knows that he’s uncovered and had no backup, he knew that the walkers outnumbered him a million to one and he could be bitten at any time, but he didn’t care. That is a sign of bravery. A foolish idea, mind you, but bravery as well and Rick has survived enough that I could see him holding off a walker herd on his own. Through some editing, anyway. However, like in the comic, I love how this also served as the rallying cry for the rest of Rick’s friends and the Alexandria residents. 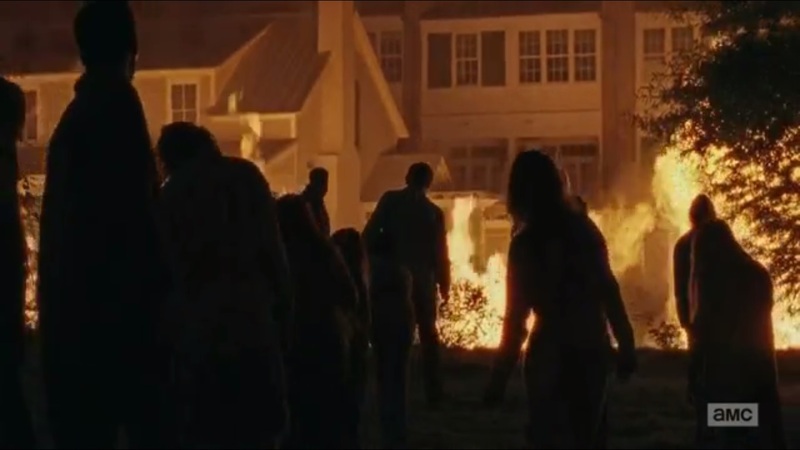 The group has seen Alexandria’s community as weak, and so far they’ve been right, but now they realized that if Rick continued at it alone, they would die. That was the push needed to bring out scared people like Tobin and Gabriel out of their shells and join the fight to protect their home. 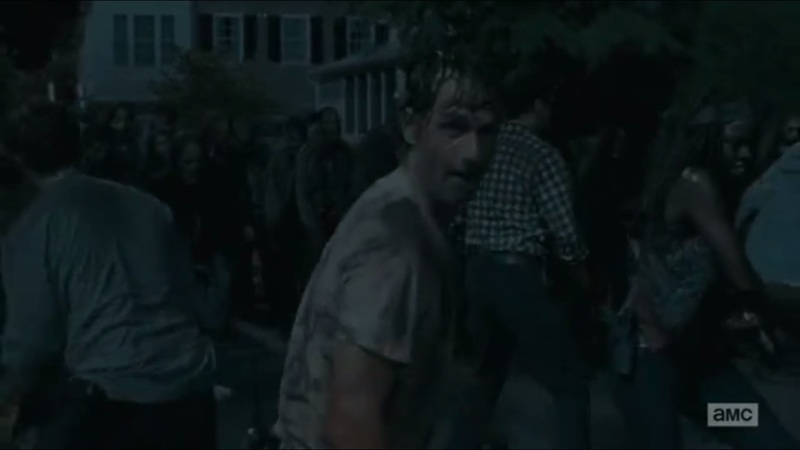 In the face of so much carnage and having the community overrun, seeing Rick out on his own gave the community a bit of hope that they could outlast this herd and maybe even bring it down. 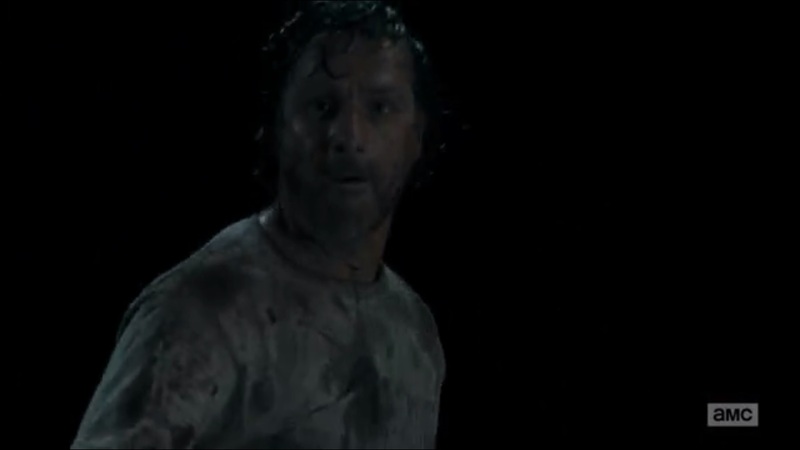 And you can see from the looks on Rick’s face when help arrives that he’s had a change of heart when it comes to the Alexandria community. That comes through during Rick’s speech to Carl- an impressive performance by Andrew Lincoln- about making the future that Deanna spoke of earlier. A new world that Rick hopes his son will live to see. Rick has already lost his wife and now his replacement wife in Jessie- the only blood family he has left are his son and daughter. And sure, Judith may be too young to grasp the situation, but Carl has lived and survived through this carnage alongside his father. This was the strongest part of the episode, in my opinion- the community coming together to save their home, not just validating Rick’s words to them about becoming stronger, but also giving him some hope that there’s a bright future ahead of them. Not to say that other elements of this episode didn’t work. 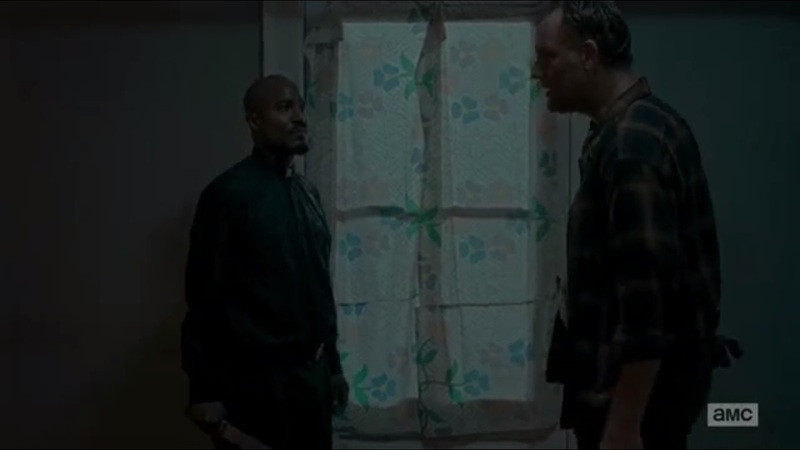 The confrontation with The Saviors at the beginning was tense, if not over a bit fast, given how we didn’t hear Daryl’s struggle with the one Savior before he broke out the RPG. It does make me wonder if that one man he fought survived. Word has to get back to this Negan fellow somehow. It was a tad convenient for Sasha, Abraham, and Daryl to show up back at the Safe Zone just when Glenn needed help, but really, no one at this point should have expected Glenn to be in danger. With that said, The Walking Dead could stand to lay off on the fake-out death moments for Glenn. They sap out whatever little tension is left surrounding him because the show has already tried to give us a big fake-out death. No more of those with Glenn, thanks. The Wolf’s slow change of heart didn’t go far, given how Carol popped him off with no trouble, proving that some people don’t change. Could the Wolf have possibly reformed and become an asset to the community? Possibly, but given his initial actions, it would be foolish to give him a chance, just as Carol saw it foolish for Morgan to keep him alive. 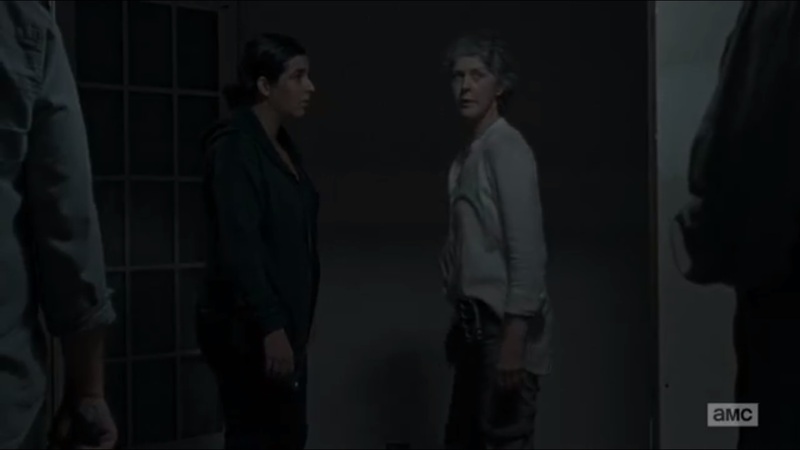 And their fight in “Start to Finish” looks to be a thing of the past now, given how they aren’t at each other’s throats and Carol didn’t kill Morgan, just as he figured. I don’t have many issues, but let’s start with going back to the previous episode’s ending. We left off with Sam calling out to his mother, louder and louder, but when we get to this episode, he’s not just quieted down and kept up with the group. He insists that he’s able to handle himself. At least, before Carol’s words kicked in and his fear surfaced at the worst time. The battle against the walker herd was an impressive sight, but one thing I could have done without was that point of view shot where we saw everyone hacking away towards the screen. Unnecessary. The fact that the community members came out of hiding and joined Rick in battle was enough to show that they had grown stronger. No need to make it look more epic or Hollywood. Minor issues aside, “No Way Out” was an effective way to continue the season’s storyline. It brought the walker battle from the comics to life, put Carl’s life in jeopardy, and Rick Grimes saw that he no longer had to just rely on his group for immediate help. The citizens of the Alexandria Safe Zone rose up, shed their inhibitions, and joined him in a seemingly endless battle that ended with them as victors. Now comes the time to heal, rebuild, and grow in order to create that new world that Deanna wanted to see. But with this Negan man still out there, things will not stay calm for long. This entry was posted in The Walking Dead and tagged Abraham Ford, Alanna Masterson, Alexandra Breckenridge, AMC, Andrew Lincoln, Austin Abrams, Benedict Samuel, Carl Grimes, Carol Peletier, Chandler Riggs, Christian Serratos, Danai Gurira, Daryl Dixon, Denise Cloyd, Enid, Eric Raleigh, Eugene Porter, Father Gabriel, Glenn Rhee, Greg Nicotero, Jessie Anderson, Jordan Woods-Robinson, Josh McDermitt, Katelyn Nacon, Lauren Cohan, Lennie James, Maggie Greene, Major Dodson, Melissa McBride, Merritt Wever, Michael Cudlitz, Michonne, Morgan Jones, No Way Out, Norman Reedus, Rick Grimes, Ron Anderson, Rosita Espinosa, Ross Marquand, Sasha Williams, Seth Gilliam, Seth Hoffman, Sonequa Martin-Green, Steven Yeun, Tara Chambler, The Walking Dead by omarid513. Bookmark the permalink.